teenagers are each from a different clique or social group. 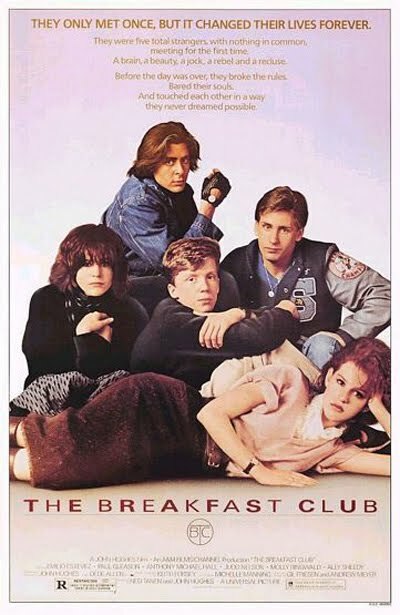 The five students – Allison Reynolds (Ally Sheedy, the loner), Andrew Clark (Emilio Estevez, the jock), John Bender (Judd Nelson, the juvenile delinquent), Brian Johnson (Anthony Michael Hall, the nerd), and Claire Standish (Molly Ringwald, the preppie) – who seem to have nothing in common at first, come together at the high school library, where they are harangued and ordered not to speak or move from their seats by the antagonistic vice-principal, Richard Vernon (Paul Gleason). They are to remain for a period of eight hours, fifty-four minutes (from 7:06 A.M. to 4 P.M., the only indication of time being on a clock that is 20 minutes fast). He assigns a 1,000 word essay (in which each student must write about who he or she thinks they are) and then leaves them mostly unsupervised, returning only occasionally to check on them. Bender, who has a particularly negative relationship with Mr. Vernon, disregards the rules and riles the other students; mocking Brian and Andrew, and sexually harassing Claire. Allison remains oddly quiet except for the occasional random outburst. The students pass the hours in a variety of ways. Gradually they open up to each other and reveal their inner secrets (for example, Allison is a compulsive liar, Bender comes from an abusive household and Brian and Claire are ashamed of their virginity). They also discover that they all have strained relationships with their parents and are afraid of making the same mistakes as the adults around them. However, despite these developing friendships the students are afraid that once the detention is over, they will return to their very different cliques and never speak to each other again. At the request and consensus of the students, Brian is asked to write the essay Mr. Vernon assigned earlier (the subject of which was to be a synopsis by each student detailing “who you think you are” (sic)), which challenges Mr. Vernon and his preconceived judgments about all of them. Brian does so, but instead of writing about the actual topic he writes a very motivating letter that is in essence, the main point of the story. He signs the essay as “The Breakfast Club” and leaves it at the table for Mr. Vernon to read when they leave. There are two versions of this letter, one read at the beginning and one at the end, which are slightly different; illustrating the change in the students’ judgments of one another and their realization that they truly have things in common. Brian Johnson (although that is unknown at this point): Saturday, March 24, 1984. Shermer High School, Shermer, Illinois. 60062. Dear Mr. Vernon, we accept the fact that we had to sacrifice a whole Saturday in detention for whatever it was that we did wrong…and what we did was wrong, but we think you’re crazy to make us write this essay telling you who we think we are. What do you care? You see us as you want to see us… in the simplest terms and the most convenient definitions. You see us as a brain, an athlete, a basket case, a princess and a criminal. Correct? That’s the way we saw each other at seven o’clock this morning. We were brainwashed. The film ends with the students walking down the hallway to leave the school. Outside, Allison and Andrew are shown kissing, as well as Claire and Bender. Claire gives Bender her earring, which he puts on after she leaves. various cliques, and through the processes of inclusion and exclusion that characterize a clique. a clique is a subset of individuals in which every person is connected to every other person. Graphically, it is a subset of points (or nodes) in which every possible pair of points is directly connected by a line, and which is not part of any other clique. 1) What are some common American high school cliques? 2) Which student represents which social clique? 3) What happens to the group identity of each student by the end of the film? 4) Are there high school cliques in your country? 5) If the answer to (4) is yes then what are some of the cliques? 5) Can a person move from one clique to another and if so then how? 6) Why do you think cliques form? 7) Are cliques good or bad, explain? 8) What clique(s) did your teacher belong to in high school? 9) What clique if any did you belong to in high school? 10) What sort of group is the Breakfast Club?